For another perspective on our seminar, check out fellow participant Ron Patkus's blog. In need of a respite from books and busy sidewalks, I took an afternoon ride west of Oxford to Farmoor Reservoir and the village of Cumnor. As you leave the city, there is a pleasant walking and cycling path along the canal. Our trip to London was filled with close encounters with a wide variety of early printed books--at the British Library, at the University of London Sterling Library, and at Maggs Antiquarian Booksellers, each exhibit rich in exemplarity and singularity. We saw a variety of early printed Bibles, including a copy of Tyndale's Bible, the Coverdale Bible and the Geneva Bible. At the University of London there were several Caxton texts on display. Of course, no photos of any of these incredible books will appear on the blog as photos are strictly forbidden. From book haven to book haven, the seminarians walked the streets of London, sharing the burden of carrying a heavy laptop. announcement to make . . . The past few days have presented a wealth of experiences--from the mundane (doing laundry communally--now there is a bonding experience!) to the sublime (requesting books in the Duke Humphrey Library). But far from settling in to a quiet academic life, there is a buzz about Oxford with the filming of the Philip Pullman novel, His Dark Materials. There are thick bundles of cables running through the lane from St. Edmund hall to the Bodleian Library, an instant Victorian scene created by pouring gravel onto the lane, and a strange dirigible light set-up that floats eerily in the night sky. Yesterday, we all recited our pledge at the Bodleian not to remove, mark, deface or injure in any way the materials in the library and--most important--"not to bring into the Library or kindle therein any fire of flame, and not to smoke in the library." So far, at least as far as we know, all the members of the group have adhered to their solemn pledge. Erika even took the pledge in Latin! Today we had a tour of Oxford University Press, heroic publishers of the quixotic and much beloved Oxford English Dictionary. James Murray took on this vast project in its initial stage. It is amazing that this icon of scholarship is based on thousands of slips of handwritten notes from hundreds of scholars. Murray's eleven children helped organize and alphabetize the entries! Though scholarship seems monumental, it is also so human and so ephemeral. Our fearless leaders, John and Jim, took a turn at the press. This past weekend was the 50th anniversary of the establishment of St. Edmund as an independent college. There were gala events, complete with ball gowns and tuxedos. A new sculpture in honor of St. Edmund was unveiled in the college "garden," a quiet grassy area and cemetery in front of the library. Karl joins St. Edmund in his reading on the bench. Teri Borus's new edition of Shakespeare's Hamlet is now in print and available at your local Blackwell's. The editor will sign copies upon request! Finally, a very happy birthday to Michael who celebrated his birthday in both a youthful and adult way. Michael rented himself a red bike on the occasion of his birthday and topped off the day with a beer (or two) at a local pub. Many happy returns of the day, Michael. Lastly, this blog is certainly an example of the shfting expectations of the author. I started the blog for my family, re-shaped it for colleagues, and now find that the audience has widened to include my fellow "seminarians" and their families and friends. Feel free to blur the authorial border by adding comments or sending me photos you'd like to add to the site. We are staying in St. Edmund Hall, one of the colleges of Oxford University. We had an incredible tour of that shrine of libraries, the Bodleian Library of Oxford University. Dr. Vaisey, Director Emeritus, regaled us with stories of candles being lit (that reader was never allowed back! ), of a manuscript being tipped off a conveyor belt onto a pool of oil on the floor, and of the initial funding of the library and the rich history of building and expansion of this library that serves the scholars of the world. The architectural style of this part of the library is English Perpendicular which allows for these lovely long windows to let in the light. Before electricity, the scholars had to work by natural light alone as no candles were allowed! Here in Brugges, William Caxton first learned the business and craft of printing. And here, too, he produced, in 1475, the first printed book in English (Recuyell of the Historyes of Troye). Brugge is a lovely small city that retained its cobblestone streets and medieval architecture. Canals threaad their way through the city. I took this photo of a typical buidling in the city--perhaps Caxton lived in such a home? What a magnificent central plaza in Brussels! Our main reason for visiting Brussels was to go to the Erasmus House Museum, a home where Erasmus spent a pleasant half year and which holds many of his volumes. There is also a beautiful and refreshing Philosophical Garden and a Medicinal Garden with herbs that attend to the illnesses that Erasmus mentioned in his letters. Erasmus lived in the late medieval period and is considered one of the foremost Humanists. He is probably best known for his work, In Praise of Folly. It is interesting to note that his life span (1469-1536) exactly coincides with what I have been calling the Ptolemaic age in Europe, the time in which Ptolemaic maps completely re-orient European worldview, just prior to the publication of the work of Copernicus, De revolutionibus orbium coelestium (On the Revolutions of the Heavenly Spheres), published in 1543 and printed in Nuremberg (where Behaim's globe was produced in 1493). A shaky 360 view of the plaza: http://www.youtube.com/watch?v=CyN92sYiaxo. Today we spent almost the whole day in the Plantin-Moretus printing museum. Christoffel Plantin (1520-1589) began his work as a protestant printer but became an arch-printer for the Catholic bishop after Antwerp came under Spanish Catholic control. The museum is a perfectly preserved printing press from the mid-sixteenth century. The presses, type and a wealth of early books are maintained as well as the family’s private rooms. We saw an incredible polyglot bible, a parallel-text Bible with Hebrew, Latin, and Greek. They also displayed atlases and maps by Gerardus Mercator—very beautiful. Of particular interest to me was a 1580 pocket size edition of Mercator’s Teatrum Orbis Terrarum. Each opening of the book had text on the left and an engraving of a country or region on the right. It was amazing that such a pocket-sized edition existed so early on. In the evening, we had a candlelight dinner at long tables down in the basement of a building where once cloth and paper and books were warehoused before being shipped to England. Our host Guido Latre speculates that Tyndale’s bible had clusters of pages slipped into the folds of the cloth for smuggling back into England. Jet lag is not bad but I sleep at odd hours of the night. There seems to be a nice nightlife in Antwerp: I walk in the evening past many outdoor cafes filled with people enjoying drinks and music. Our seminar began today and we had a chance to meet everyone. The seminar is directed by Dr. John King and Dr. Jim Bracken, both of the Ohio State University. Dr. Guido Latre of the Catholics University of Leeuwen (and Louvain) gave a wonderful introduction to Antwerp, the dual languages of Flemish and French, and the history of protestant John Tyndale’s time in Antwerp. Tyndale had fled England under fear of persecution and come to Antwerp for protection. Here he was able to continue his work on the Bible but was eventually captured and ultimately strangled and burnt at the stake. What a horrible history between Catholicism and Protestantism. Professor Latre took us on a delightful walking tour of the city where, among other sites, he pointed out the religious history of the city as reflected in the architecture—the clean gothic lines of the Protestant cathedral with the baroque alter of the Spanish Catholics who overtook Antwerp. As Antwerp lost the wool trade to England, they developed into a printing center (in 1500). In the afternoon, I went to the grocery store to buy some fruit and came across a huge wall of packaged deli meat! Each morning for breakfast we have about four to six choices of salami, ham, bologna etc. Cherries and asparagus are also in season, but the restaurant where we ate dinner (stroganoff) was out of the famed white asparagus of Belgium. It is Sunday and the day has such a different feel here (of course, that could be jet lag!). Almost all the shops are closed except an open air flower market, a tourist trinket shop and an edgy shoe store. As a result there is this wonderful sense of relaxation. Lots of Antwerpians (?) are strolling about the city but the pace is relaxed. The cafes in the plazas are full, with people sitting, “eten and drinken,” and enjoying some leisurely people-watching. I learned (and should have known) that Belgians speak Flemish, a dialect of Dutch and, in the south, of course, French. I met one of the other participants, Terry, and she and I enjoyed ambling around the historic part of Antwerp. 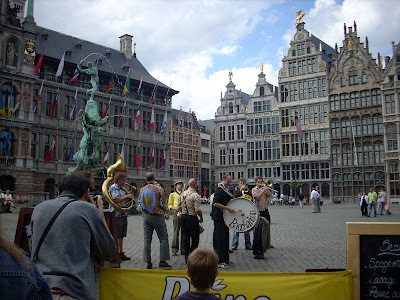 We had a beer in the plaza by the Cathedral and heard a lively cross between a high school pep band and New Orleans jazz. The guy on the cymbals really knows how to have fun! (Apologies on the poor video technique!) A long and cramped transatlantic flight and a glass of Belgian beer are having their effect after 24 hours without sleep . . .